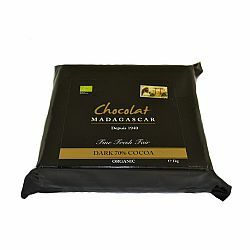 A rich and flavourful Madagascan dark chocolate, perfect for cooking and baking. The dark is exceptionally smooth with a pleasant buttery texture. In addition to berries and raisins the bar has a light spice. A initial aroma of black pepper develops into a strong roasted notes full of dried fruits. We also detected an usual hint of acidity leading to a balsamic finish. This a 1kg block of organic dark chocolate couverture.